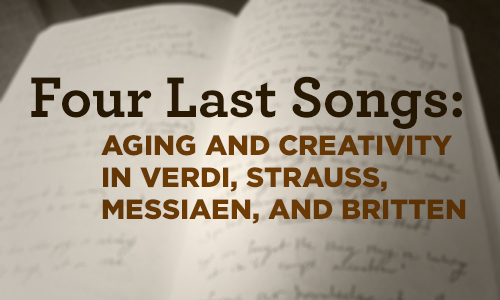 Linda and Michael Hutcheon on "Four Last Songs: Aging and Creativity in Verdi, Strauss, Messiaen, and Britten"
As we entered our seventh decade (yikes! ), we realized that there was now a new period of life, that time beyond the usual point of retirement, for which there were precious few models. Firmly believing that opera (our particular passion) offers a perspective on practically all aspects of the human condition, we decided to examine the later years and last works of several successful composers of opera. Our goal? An understanding of their last years within the context of their entire artistic life course—and of the role of creativity in these years. Of course, our current culture is one that is highly commercialized, resolutely anti-aging, and decidedly death-denying. It purports (with appropriate purchases) to keep us young forever, as though that were possible. The reality is, however, that we all age (if we are fortunate), and our lives change: social roles alter; the decline of physical health and cognition become worries and possibly realities; the world around us changes, sometimes at our expense. We wondered how artists of previous generations dealt with these inevitable changes. Did their creativity permit them to maintain social roles in later years? Did their creative works give them a forum in which to address those issues of aging and mortality? And, most importantly, what could we learn from their examples? These are the questions that generated this book about aging and creativity, concepts that for many people do not sit easily side-by-side. However, as the lives of artists like Michelangelo (1475-1564), Goethe (1749-1832), and Elliott Carter (1908-2012) attest, they most certainly can. The canonical composers whose later-life stories are told in this book—Giuseppe Verdi (1813-1901), Richard Strauss (1864-1949), Olivier Messiaen (1908-1992), and Benjamin Britten (1913-1976)—offer radically individual responses to this conjunction of later life and creativity. Each of these composers was a musical icon in his own country and, in his later years, each wrote an opera in which concerns about creativity and aging coalesced. The composition of an opera always requires a major commitment of time and energy because of the size and complexity of the work. To undertake this task in their later years meant exposing their creative activities to new pressures. These were multiple and, more importantly, different from those experienced by their younger selves—ranging from ill health to the critical expectations that stemmed from their previous success. We found that their late works did indeed help them to explore creatively their own aging and mortality; however, all of them also had to face those challenges that came with their own personal aging. In addition, the social, political, and aesthetic changes of their times—from World Wars to the rise of musical modernism—offered external challenges both to their creativity and to their sense of themselves as artists and persons. The book tells the stories of their different but equally creative ways of addressing all these challenges and changes. It looks at their attitudes to their own aging and creativity and also steps back and assesses both those late operas and their critical reception at the time of their composition and subsequently. What did we learn? Well, just as each composer began his career in an individual manner, so each also ended it in a unique way—thus belying one of the powerful clichés about older age in the media and in popular culture: that all older people are the same. Rather it is the complexity of the interrelationship of aging and creativity that leads to the radical individuality of these artists’ later years. Creativity in older life is not only possible, we learned, but a powerful aid in meeting the challenges of later life. Linda and Michael Hutcheon’s book, Four Last Songs is available now at these fine bookstores and online. Learn more about the book here. Michael Hutcheon is Professor of Medicine, and Linda Hutcheon is University Professor Emeritus of English and Comparative Literature, both at the University of Toronto. Together they have written three other books using opera as their cultural vehicle of choice: Opera: Desire, Disease, Death (1996), Bodily Charm: Living Opera (2000), and Opera: The Art of Dying (2004).